The discovery of an insect in Texas that could have devastating effects on the United States’ sugarcane industry has attracted the attention of researchers at Sam Houston State University in Huntsville. The invasive Balclutha rubrostriata, or red-streaked leafhopper, has been found in the San Antonio area, and its damaging tendencies have been well documented in Southeast Asia and Australia, according to Jerry Cook, an entomologist who also serves as associate vice president for research at SHSU. Cook is one of more than 40 scientists throughout the Texas State University System working through the Institute for the Study of Invasive Species, located at Sam Houston State, to study and develop strategies to deal with invasive species across the state. In Texas, sugarcane is produced in the lower Rio Grande Valley, where the economic impact exceeds $200 million and provides several hundred permanent jobs in a region where employment opportunities are well below the state average. The United States ranks third in the world in sugar consumption. Along with Texas, sugarcane is grown commercially in Florida, Hawaii, and neighboring Louisiana, where it ranks first in the state among plant commodities. “If the leafhopper becomes established in Texas, it won’t be long until Louisiana feels its damaging effects as well,” said Cook. Leafhoppers have piercing and sucking mouthparts, which they use to extract the sap from sugarcane. However, even without feeding on the plant, the leafhopper can do considerable damage by transmitting diseases that decrease the plant’s fitness. 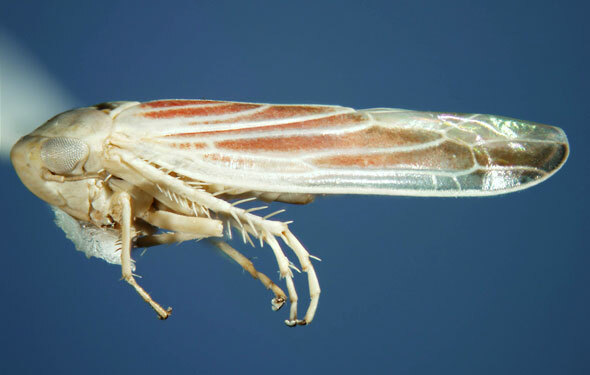 The leafhopper’s existence in Texas was discovered by accident during a routine study in Bexar County in 2008. Cook read about the discovery in the professional journal “Entomological News,” which was published last year. “As soon as I read the article, I knew it was not a good thing to have this species in our state,” he said. As a strong proponent of “early detection/rapid response” for managing invasive species, Cook assembled his research team of biology professor Autumn Smith and biology graduate student Chris Wilson and began making plans for a full-scale study. “It’s one of the tenets of the Institute for the Study of Invasive Species,” Cook said. “A lot of people talk about early detection and rapid response being critical to working with invasives, but very few groups are doing that. Most of what is done is very reactionary. We only start putting resources into it when it becomes a giant problem. SHSU will again survey the insects around the San Antonio next month. Depending on how extensive the study turns out, partners at the other institutions in the Texas State University System will become involved. The timing for SHSU’s research is especially good for sugarcane producers in Texas. Later this year, the U. S Department of Agriculture is closing the Kika de la Garza Subtropical Research Center in Weslaco, which has been responsible for conducting research on crops and agriculture imports from Mexico and Central America. “The one resource the sugarcane growers in that area have been using is going away,” Cook said.